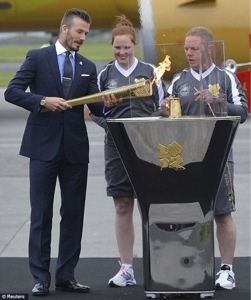 Just in from this proud of a moment David Beckham is set to continue is build up to the Olympics by parading in Cornwall with the Torch, as it contains its journey to London to be lit. The arrival in Cornwall preceded the start of the 70-day, torch relay around Britain, which will end on July 27, when the flame is used to ignite the cauldron in London's Olympic Stadium.
" David bringing the Olympic torch to the UK today! so exciting and so, so proud!! X VB"